Last week I returned to my volunteer gig with the very youngest kids in after-school care at my daughter's school. I'll be going in every other week through the school year to read a book or two and supervise a craft activity with a group of about 18 four- and five-year-olds. 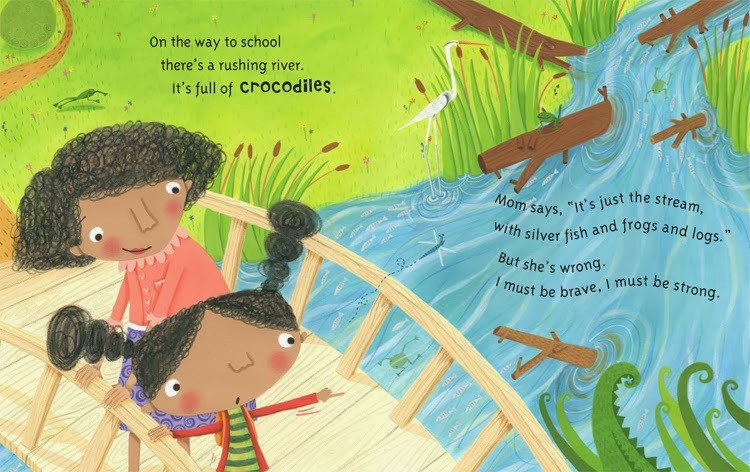 Most of the kids in the group I am working with are going to school for the very first time, so I knew brave and strong Ruby would be an inspiration to them! 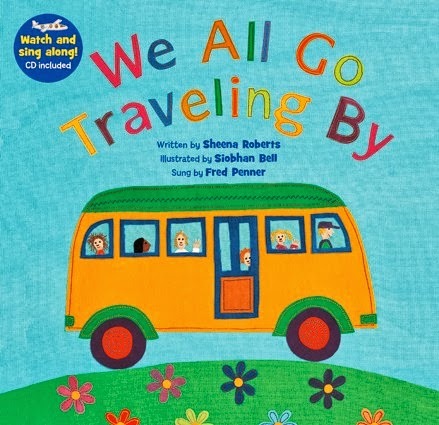 This book has great repetition and rhythm as different modes of transportation all make their way to the schoolhouse, and the kids really got into singing the refrain on each page with me. We all go traveling by! 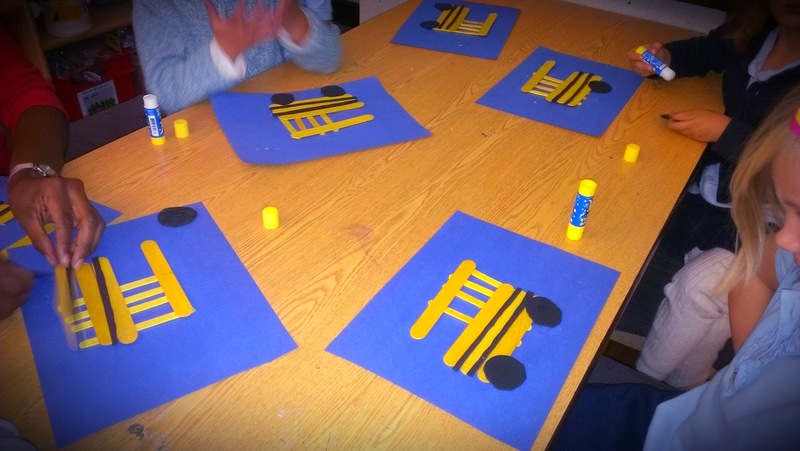 After we read both books, it was time to make our school bus craft. The bus is made from two sized of craft sticks - four the size of popsicle sticks and four the size of tongue depressors. Since I try to avoid paint or anything else too messy for these sessions, to minimize clean-up time for the teachers, I got craft sticks that were already colored yellow; you could add painting the sticks to your craft time if you are so inclined. 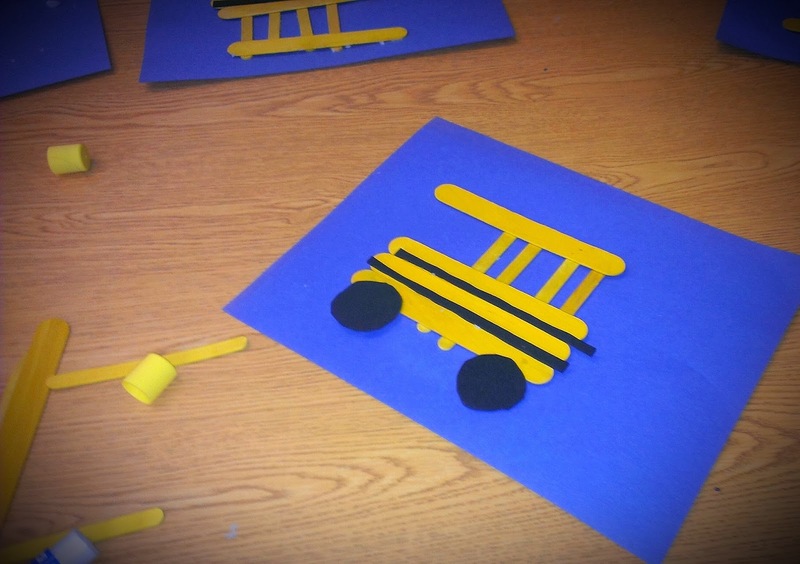 The wheels and the two stripes on the bus are cut from black foam sheets; you could also use construction paper, but I thought the texture of the foam sheets worked well here. I had the kids glue the four smaller sticks to the top stick first, then turn the whole thing over and glue it down to the blue construction paper. If I do this craft again, I would spend the extra prep time to draw four lines on each piece of construction paper for them to glue the smaller sticks to. 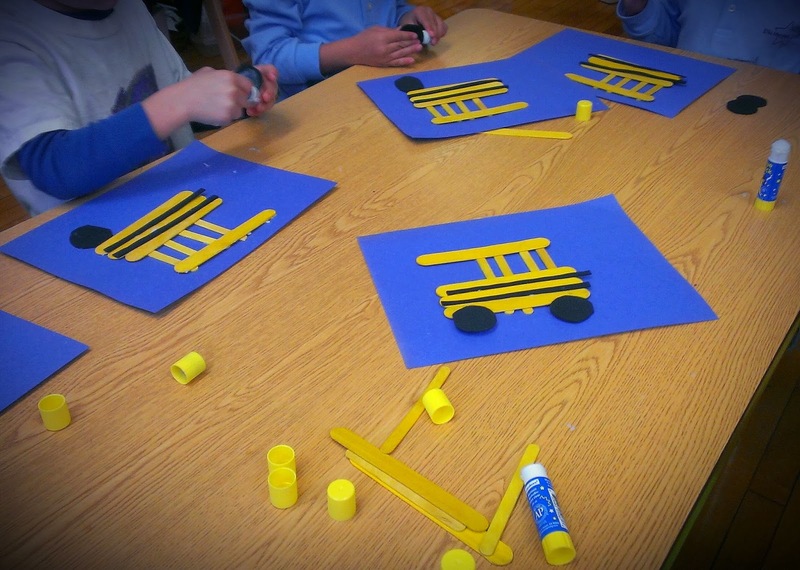 The kids went a little crazy with the glue sticks, but for the most part their school buses were dry when their parents came to pick them up from the after-school program. 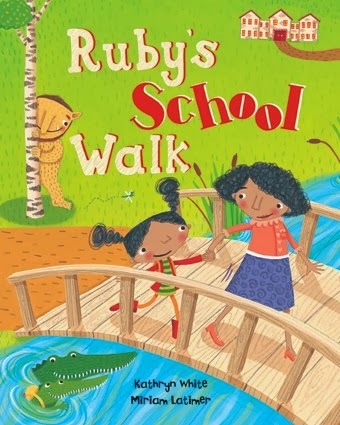 When we finished our school buses and were waiting for parents to come, we read Ruby's School Walk once more; this time I showed the kids the dragonfly that follows Ruby everywhere and asked them to find it on every page. A perfect ending to a fun craft time!